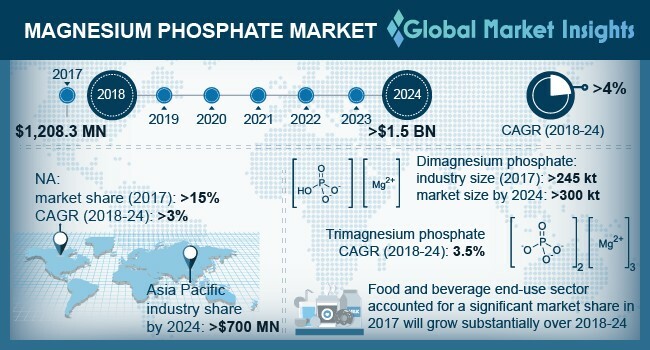 Magnesium Phosphate Market size is estimated to surpass USD 1.5 billion by 2024; according to a new research report by Global Market Insights, Inc.
Increasing consumer spending on bakery products due to changing food habits globally will propel the magnesium phosphate market growth. Improved leavening & anticaking functions along with higher product usage as acidulant has enhanced the product scope in bakery applications. As per World Grain, global breads and rolls market is estimated to reach USD 216 billion by 2020. Moreover, higher product adoption in cheese preparations and cheese-based sauces as emulsifying salts will support industry demand. Rising product adoption in biomedical industry as drug and gene delivery vehicles are among major factors driving the industry growth. Technological advancement in nanoparticles has enhanced the product penetration particularly in biomedical industry. In addition, strong outlook in scaffolds for growing bones and tissues will propel the magnesium phosphate market. Shifting government focus to promote food safety and healthy lifestyles will propel the magnesium phosphate market demand. According to National Institute of Health (NIH), the phosphorus and magnesium both are essential minerals for improving bone health and physiological role in the body. Combating fatigue, maintaining energy, enhancing nerve and muscle health, enhanced protein production along with mineral enrichment are major health benefits driving the industry demand. Growth in healthcare industry coupled with rising geriatric population and increasing healthcare spending are among key supporting factors for magnesium phosphate market growth. Raw material scarcity causing limited production along with development of advanced substitute products may hamper the industry growth. Food & beverages are expected to witness notable gains up to 2024. Shifting customer preference towards healthy lifestyles coupled with guidelines for standardized dietary reference intakes will support the product demand. Rising demand as food additive mainly in bakery and dairy applications will drive the magnesium phosphate market size. Additionally, significant health benefits including reduced fatigue, improved blood pressure, protein synthesis and energy metabolism will stimulate the business growth. Strong outlook as active ingredients to prevent eclamptic seizures, psychiatric disorders, asthma and heart attacks will propel the product demand. Moreover, prevention from bladder problems, frequent urination and diabetes will propel the product scope in pharmaceutical applications. Dimagnesium phosphate market is anticipated to register over 300 kilo tons by 2024. Rising demand from packaged food products will propel the business growth. Increasing product usage as PH regulation reagent, emulsifier and stabilizer to preserve flavors and enhance food taste are among major factors driving the industry demand. In addition, rising demand from animal feed industry will support the product demand. North America accounted for over 15% of the global magnesium phosphate market share in 2017. Growth in pharmaceutical industry along with increasing healthcare spending in the region are key factors driving the industry demand. Potential applications as active pharmaceutical ingredients will support the industry demand. Celtic Chemicals, KRONOX Lab Science, Triveni Chemicals, Refractory Minerals Company, Innophos and Jost Chemicals are among major magnesium phosphate market participants. Other prominent industry players include Manus Aktteva Biopharma, Nexgen Chemicals, Hap Seng, Pacific Chemicals Company, Shanpar, Redox and Nikunj Chemicals. Mergers and acquisitions, product innovations and supply agreements for business expansion are the major strategies adopted by industry participants. For instance, in August 2017, Innophos Holdings acquired Novel Ingredients to expand business in nutrition market and develop innovative ingredient solutions for customers.